The Aravon Tess Dark Brown will take you where an athletic shoe can't. The Aravon Tess Dark Brown is a gore slip-on that is part of the Traversa Collection. The Tess is lightweight with a soft leather and is versatile enough to keep you comfortable the entire day. 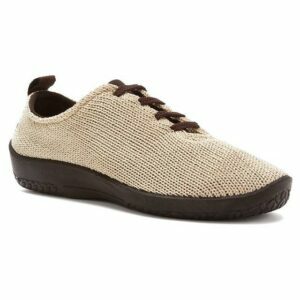 In addition, the cushioned anti-microbial footbed is removable and is made with triple-density EVA, memory foam. Also, the built in stability cradle and metatarsal bump adds additional support and comfort to this already amazing shoe. Likewise, with it’s low profile and sporty look, the Tess will take you places that an athletic shoe can’t. This shoe also features a low profile flexible outsole with a midfoot shank and a dual density PU wedge. Click to View All Aravon Styles.